The rapidly-growing embedded conference covers a range of sectors and application areas. As we arrive back from a busy, and unusually warm, Embedded World 2019 and recall the many interesting discussions we had over the three-day show, one thing is most certainly clear: This is the Mobile World Congress (MWC) event for Nuremberg. Its many halls were jam-packed with technology from a wide variety of sectors but also with an array of application focal points. There was everything you would expect from an embedded electronics show, all of which secures its place firmly on the ‘event to be seen at’ if you are involved in embedded system technologies, safety and security for embedded systems, the Internet of Things (IoT), IIoT, M2M Communication, embedded vision, autonomous systems, hardware- and software-engineering, hardware, software and tools. 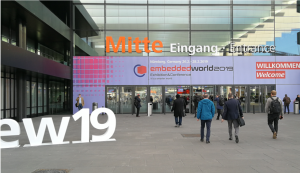 Embedded World 2019 was the 17th edition of the global embedded community event and it saw a substantial growth in exhibitor numbers and significant global attendance. 1,117 exhibitors from 42 countries, 31,000 visitors from 84 countries and 2,000 conference participants from 46 countries. 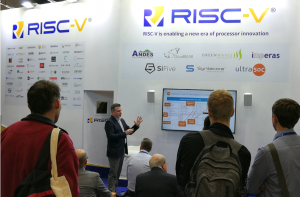 UltraSoC demonstrated its continuing support for RISC-V and exhibited on the RISC-V pavilion in Hall 3A. 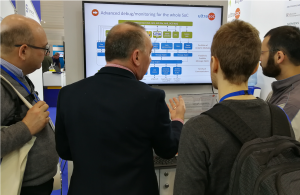 The booth was a hive of activity and as well as showing live demonstrations of our embedded analytics technology, we also showcased the award-winning UltraSoC Lockstep Monitor which can support any processor architecture or other subsystem, including custom logic or accelerators. Lockstep operation is needed for safety standards such as ISO26262 for automotive, IEC 61508, EN50126/8/9 and CE 402/2013. 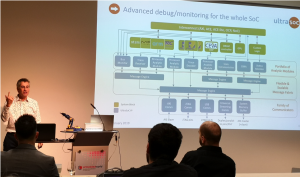 We also offered a first chance at a public event to see UltraDevelop 2 in action – and how it integrates partner technology from Imperas and Percepio. On the first day of the show, UltraSoC also announced an expansion of our architecture to better support designers of complex multicore systems for the age of machine learning, artificial intelligence and parallel computing. We had two further announcements around the show; UltraSoC’s support for Western Digital’s RISC-V SweRV Core and OmniXtend cache-coherent interconnect; and we also announced the appointment of Redtree Solutions as our technical sales representative in Europe to support a growing opportunity for UltraSoC’s embedded analytics particularly within automotive, and other safety- and security-critical applications. Click here to watch Rupert’s on-booth presentation. 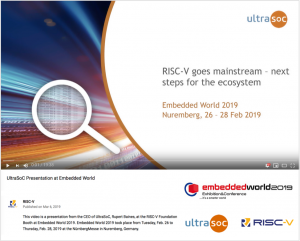 2019 is set to be another big year in the growth and development of RISC-V.
Read John Hartley’s recent blog post where he talks about ‘2019: a year for us all to get truly embedded with UltraSoC’ as he looks at the developments and opportunities for the year ahead. We are already looking forward to and making plans for Embedded World 2020, which takes place on 25-27 February 2020. See you there! Jo Windel is the marketing manager at UltraSoC.